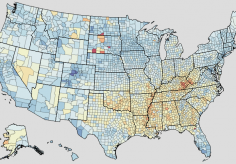 To estimate age-standardized mortality rates by county from cardiovascular diseases (CVD). De-identified death records from the National Center for Health Statistics (NCHS) and population counts from the census bureau, NCHS, and the Human Mortality Database from 1980 to 2014 were used. Validated small area estimation models were used to estimate county-level mortality rates from all cardiovascular diseases, including ischemic heart disease (IHD), cerebrovascular disease, ischemic stroke, hemorrhagic stroke, hypertensive heart disease, cardiomyopathy, atrial fibrillation and flutter, rheumatic heart disease, aortic aneurysm, peripheral arterial disease, endocarditis, and all other cardiovascular diseases combined. Cardiovascular diseases were the leading cause of death in the United States in 2014, accounting for more than 846 (95% Uncertainty interval [UI]: 827–865) thousand deaths and 11.7 (95% UI: 11.6–11.9) million years of life lost. The gap in age-standardized CVD mortality rates between counties at the 10th and 90th percentile declined 14.6% from 172.1 deaths per 100,000 persons in 1980 to 147.0 deaths per 100,000 persons in 2014 (posterior probability of decline: >99.9%). In 2014, the ratio between counties at the 90th and 10th percentile was 2.0 for IHD (119.1 vs 235.7 deaths per 100,000 persons) and 1.7 for cerebrovascular disease (40.3 vs 68.1 deaths per 100,000 persons). For other CVD causes, the ratio ranged from 1.4 (aortic aneurysm: 3.5 vs 5.1 deaths per 100,000 persons) to 4.2 (hypertensive heart disease: 4.3 vs 17.9 deaths per 100,000 persons). The largest concentration of counties with high CVD mortality extended from southeastern Oklahoma along the Mississippi River valley to eastern Kentucky. Several CVD conditions were clustered substantially outside the South, including atrial fibrillation (Northwest), aortic aneurysm (Midwest), and endocarditis (Mountain West and Alaska). The lowest cardiovascular mortality rates were found in the San Francisco Bay area, central Colorado, northern Nebraska, central Minnesota, northeastern Virginia, and southern Florida. Large differences exist between county ischemic heart disease and stroke mortality rates. Smaller differences exist for diseases of the myocardium, atrial fibrillation, aortic and peripheral arterial disease, rheumatic heart disease, and endocarditis.